Reverend Quentin J. Morris, Sr.
Pastor Quentin J. Morris, Sr., is a native of Talladega, Alabama and the son of Mr. and Mrs. Robert Morris. He acquired both his elementary and high school education in the Talladega County public school system. Pastor Morris has a Bachelor’s degree in Ministry and a minor in Counseling Psychology from Brewton-Parker College in Mt. Vernon, Georgia and a Masters of Divinity from Amridge University in Montgomery, Alabama. Pastor Quentin Morris has served as the Moderator of the Ludowici District of the Tattnall Missionary Baptist Association and is a certified teacher for the National Baptist Convention, Inc. Pastor Morris is an appointed member of the board of the Michael Guido School of Evangelism at Brewton-Parker College, in Mt Vernon, Georgia. 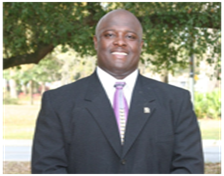 Pastor Morris is an active member of the Lambda Tau Chapter of Omega Psi Phi Fraternity, Inc. where he serves as chaplain. Pastor Morris has served as pastor of Mt. Moriah Missionary Baptist Church of Manassas, Georgia, Macedonia Missionary Baptist Church, Ludowici, and First African Baptist Church, St. Simons Island, Georgia. Pastor Morris has a zeal for God and is a willing servant for the Lord. He is sold out to a life of preaching and teaching the good news of Jesus’ return! He is a family man that values any time spent with his family. He and his wife, Monina have four beautiful children: DaQuendra Jackiel, Quiana Yvonne, Quentin Jermaine, Jr. and Malachi Myles.